After reading IPA: Brewing Techniques, Recipes and the Evolution of India Pale Ale, by Mitch Steele, I became obsessed with the (kind of) revelation that historic IPAs were so similar in recipe to their contemporary American counter-parts, and yet so incredibly different in how they were aged, perceived, and consumed. Even today, there are broad differences in how IPAs are brewed across regions: you have your West Coast pale citrus hopbombs, your maltier East Coast IPAs, and then the curious case of the modern English IPA, which tend to be maltier, smoother, and less aggressively bitter. Yet all of these are far from what the original IPA was like — and the modern English IPA is possibly the furthest of all, aside from the particular hop varieties used. I'll try hard to avoid just regurgitating half of that book in my explanation here — and I'm certainly not expert on early IPAs and their recipe formulation — but here's the basic gist. The India Pale Ale was brewed to be as pale and dry as possible, with only pale ale malt. Yes, crystal malt was shunned for the style (amen). Historic English IPAs were intensely hopped, even beyond the point of many contemporary American imperial IPAs. Some examples were brewed with three, up to four ounces of hops per gallon. Four ounces per gallon of whole cone hops! (How in god's name did they have any beer left?!) Though just to put those hopping rates in some context, they were brewing with low alpha acid / possibly poor utilization EKG hops — the hops we typically use for IPAs today are more "efficient," so to speak. Super pale, super dry, super hoppy. What does that sound more like to you, an IPA from California, or from England? But here's the kicker: historic India Pale Ale was not meant to be consumed fresh. Though it defies all conventional wisdom and common sense, the English aged their IPA for about a year before even shipping it to India. The perception that beer is always better fresh is a relatively modern one, another half-truth "learned" during the lite lager post-Prohibition era. Historically, many styles were not considered mature for a year or so, and IPA was, oddly enough, one of them. 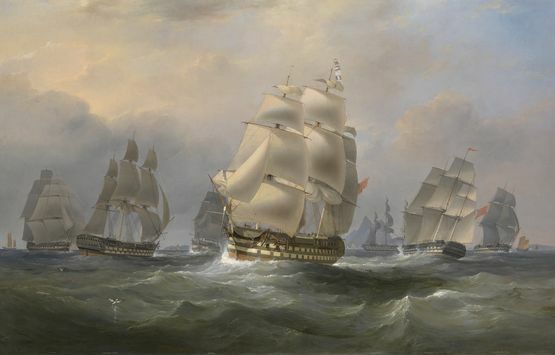 After a year of aging in England, it was shipped off to India — a voyage which could last up to six months itself. Why? Why, in god's name, would you brew a beer entirely focused on hops, and then do the one thing that's almost guaranteed to destroy hop character? Well, one reason seems to be that they didn't like the bitterness so much, and aging was meant to mellow out that character. Okay, sure. I guess they never discovered the hopbursting technique, huh? But clearly, there must have been more to it than waiting for age to hit the reset button on those IBUs; something must have been gained by using such massive quantities of hops at the start of boil, or else why do it in the first place? Four ounces per gallon of whole cone East Kent Goldings hops is going to contribute a very special flavor, undoubtedly, and if it was simply a matter of capturing that mature hop flavor once the harshness mellowed out, fine. But IPAs rarely work like that: oxidation and skunking sets in, and within a few months — much less a year and a half — your beer might well taste like barbecued shrimp. Even American craft IPAs, with the benefit of our modern advanced bottling techniques, can taste downright awful after six months on the shelf. But the British were shipping their beer in sweltering, overheated cargoholds, on a rocky six month voyage. Far from ideal conditions when you're trying to avoid oxidation. So, personal preference aside, how could have the original India Pale Ale tasted good to anyone? "The British just had very peculiar taste," doesn't cut it as an explanation, in my opinion. No one ages IPA today — even brewers that don't like bitterness. So why is no one aging IPAs? Sure, aging is an expensive process, but many styles of beer are aged despite the hassle. If it tasted good, someone would be doing it. Take a look at the thousands of craft brewers doing all sorts of wacky things, every day, and not one is aging their IPAs for a year and a half. And yet up until the 1900's, this is how every single IPA was made. Something is not right here. What happened around the 1900's? Well, among other things, brewers finally began to learn about yeast. Sanitation practices vastly improved and fermentation became carefully controlled. Brewers learned about Brettanomyces. Wild yeast became something that was either avoided altogether, or introduced intentionally. I don't think this is a coincidence. So what about this: the original IPA was, in fact, a Brett beer. "Assuming that every single barrel of India Pale Ale ended up infected seems like a leap," you might say, so let me first remind you that Brettanomyces was probably quintessential to the flavor of British beer at the time. It's likely that almost all aged ales, particularly strong beers like British old ale, developed a Brett character, and were expected to develop that character. It was simply what happened. IPA was aged for similar lengths of time, but it's impossible to say for sure if that character was considered an essential part of the flavor (as opposed to an occasional infection), since no one knew that Brettanomyces existed at all until after the hey-day of IPA. Records then weren't quite as thorough as those we bloggers keep today. No notes regarding IPA would have ever contained the phrase "this beer contains a splendid Brett character, my dear chap," because "Brett character" was just something expected to develop in aged beer, and no one really understood where it came from. While no one completely agrees whether — or how much — Brett played a role in the IPA's eventual flavor, I think it's safe to say that it's a solid explanation, and obviously the one that I'm backing. Mitch Steele covers the theory in his book: "The secondary fermentation of IPA that occurred in the barrels during the summer months of aging in England and during the boat trip to India remains the subject of much interest and speculation. From the flavor descriptions of IPA in India that we have seen and the documented arrival of the beer in sparkling condition, the secondary fermentation undoubtedly is the source of much of this beer's unique character. The one theory that seems to make the most sense is that the secondary fermentation in the IPA barrels was the result of Brettanomyces yeast activity." (IPA, page 93). On the next page, Steele gets into more specifics. "The flavor and analytical characteristics of IPA... also support the theory of Brettanomyces action in the 1800s IPA. For example, IPA is repeatedly described as being exceptionally dry. Analysis backs this up, with final gravities recorded in the 1.004 - 1.010 SG range, which is lower than one would expect standard brewer's yeast to ferment out." And there are other reasons to suspect that historic IPA had as much in common with Orval as Twisted Thistle. Back to that hop issue: Brettanomyces could theoretically provide the magic bullet necessary to explain why/how IPAs still tasted good. Brett is like Neo in the Matrix: able to step in and reshape the reality of his world. (If you look through a microscope at Brettanomyces cells, you'll notice that they're all wearing dark sunglasses and trenchcoats). I'll differ to Chad Yakobson here — the brewmaster at Crooked Stave, and one of the foremost experts on Brettanomyces out there. Chad has talked about Brett's ability to rearrange hop compounds and even possibly ward off oxidation. I won't elaborate more so as to not get in over my head and say something inaccurate, but this jives with my own experiences, and is something I'm going to experiment with and observe in the future. Like with this project. That is an insane mountain of trub. The recipe for my 1800's India Pale Aged Ale is not based on any specific historic recipe, but is loosely inspired by the many recipes and techniques mentioned in Mitch Steele's IPA, with 10 ounces of East Kent Golding hops, a grain bill of only pale ale malt, and an OG of 1.070. The experimentation will be in the aging of it, of course. I fermented this with only an English yeast to start (West Yorkshire, specifically), but after a couple of weeks in primary, I'm going to rack the majority of the batch to a 3 gallon carboy, add Brett C (the Brett strain originally isolated from an English brewery), and let it age for about a year. Whatever doesn't go into secondary is going to get bottled immediately (minus any Brett) for a "young" tasting. While I don't expect to have much left for the young portion, I plan to save at least one bottle... which will age for the same amount of time as the Brett 'infected' IPA. This way, I will be able to taste the beer fresh, aged without Brett, and aged with Brett, and therefore be able to make an informed guess which most closely resembles the described character of a historic IPA — and whether Brett makes a difference in the spoiling of hops over time. To my knowledge, there are no breweries in the world producing a beer like this. That strikes me as incredible, given the obsession over IPAs, and their storied, important role in the history of British beer. Brewing an English IPA, then aging it for a year with Brettanomyces, is a process done for many other Brett and/or sour beers, and I am dying to find out what happens. But to be clear, I do not believe you could exactly replicate historic IPA without giving your beer three months to live in a hot, humid, and turbulent cargo hold — and there's no way I'm going to try to duplicate that. This is me aiming to land in the ballpark, not attempting a precisely faithful recreation. There are 100% Brett IPAs out there today, I know — but not many of those, either. I don't believe a 100% Brett IPA would be quite the same thing, and besides, they're usually not "English" in style either. (I've brewed a 100% Brett IPA myself, and will do so again, and I plan to see how these hold up over time as well. I have two bottles of my last one stashed away which I now consider research for this project). 100% Brett IPAs are one of my favorite under-explored styles of beer, particularly with Brett Trois, but the fermentation of such beers is nothing like what historic India Pale Aged Ale would have experienced. Have you ever seen a beer like this? Are there beers like this in production that I'm missing? Are you brewing a historic English IPA yourself? Let me know. I'm betting there's a lot of experimentation to be done here — nothing can remain obscure for long in today's craft beer world. Tasting notes for the version of my IPAA without Brett are here. Tasting notes for my IPAA with Brett are here. Cool experiment! I too just finished reading the IPA book and will be watching for your updates in a year. You bring up a very good point about why this whole process isn't being replicated? It is quite backwards from the hoppy beer trends of today. The only reason I could think people aren't doing it is that they deem it a "waste" of hops and they don't see the end product being worth the cost they would have to charge. Thanks! I'll be keeping the "brew log" at the bottom updated any time I take a sample. This would definitely be expensive on a commercial scale, for sure. I mean, you can see how much beer I lost to trub in the photo above, and that was only using about half the ounces that some historic recipes used. But with a lot of breweries are charging 25/30 bucks for some sour beers, so I'm sure you could make it worthwhile. I think it's also just the fear of aging an IPA that long and having it come out all oxidized and terrible... it'd be a very expensive experiment to fail. Plus, there's no tradition behind it at this point... even lambic were brewed by someone, somewhere through the 1900's, but the Aged IPA completely vanished 100 years ago. 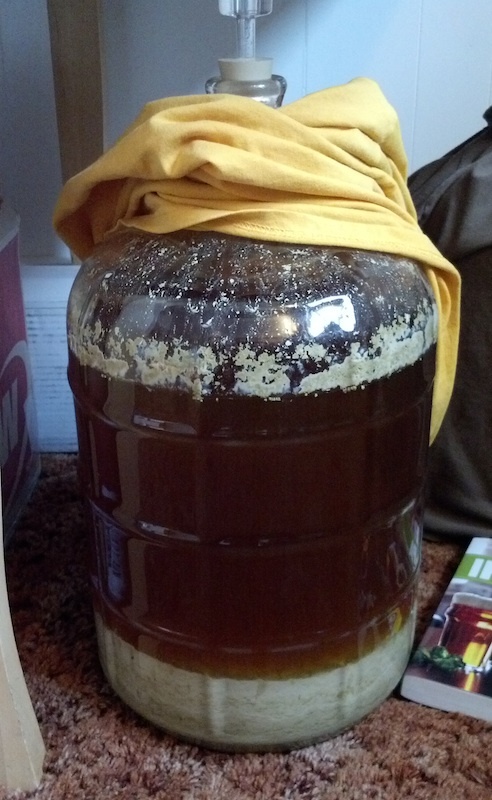 Any dry hopping during aging? I'm wondering if hops were added pre voage, I don't recall from my reading of IPA. Good question. I'm going off memory here, but I think it mentioned that some examples were dry-hopped in England after fermentation / before aging. (I think...) That would have been pretty early in the process though, since they tried to filter everything out of the beer before moving it to barrels and shipping. It seems like a waste of hops to dry-hop before aging a year, so I'm just skipping them altogether, most likely. I'm sure they were dry hopped. At what point in the process do you think they were dry-hopped? I'll have to skim through "IPA" again and see if I can find some more on that. That's awesome, glad to hear someone else is trying this. It'll be interesting to compare results. I believe, according to the book, much of the IPA during the early part of the era had lots of additional hops stuffed into the casks before shipping as a preservative, this may have also given the Brett a little more hop compounds to work with and transform. I don't remember what it says regarding the Burton era if they still continued this practice however I would hardly consider that dry hopping as we currently think of it. Glad to see someone finally try and brew a beer like this. Another thing that will be interesting to see if this new knowledge about white malt's role in the making of IPA will influence maltsters to start making this kind of malt again, I would love to brew an IPA with some of that. It gets mixed reviews but I think it's excellent. It's aged for about 6 months before bottling and has a pronounced Brett character. In fact I need to get some more! I made a beer based on it years ago and did age it for a long time. No brett, but the age did not have a deleterous effect on it. It was too harsh to drink fresh (or maybe my tastes have changed and I'd like it fresh now) so the aging worked well. I'm glad someone else is doing this as it's next on my list to do, so I'll be watching this blog with interest. Thanks for pointing those out Mat, very helpful. That's the first I've heard of that beer, and hopefully one day I'll get to try it. I find beers that defy what people are expecting never do well on the rating sites, which is a shame. Even if it's the historically accurate version of the style, people are too quick to judge it based on what they're told the style should be now. I'll have to check that beer out too, looks like a good resource. Thanks! This definitely won't be the last time I run an experiment on this. How's the bretted version coming along at the moment? Have you had any sneaky tastes? I did sneak a taste (well, a totally acceptable gravity reading, I guess) earlier this summer. It's dried out a few points lower than the non-Brett version, as expected, and has a really pleasant funk developing. I'll have to do another taste soon, as it actually won't be all that long until I'm ready to bottle it. Sounds great! You've inspired me to have a go at this. I need to place an order for more malt soon so I'll add a huge amount of Goldings hops to the order and have a go. Last weekend I have a hugely productive brewing weekend making various beers including 100% Brett beers and 'clean Ales. Awesome, your blog is saved in my reader! Looks like it's off to a good start. I'm curious to hear how your Trois beer comes out. Just as a thought. I've just brewed bottled an old ale using Wyeasts Old Ale Blend which includes Brett. Do you think that would be a good yeast for something like this? 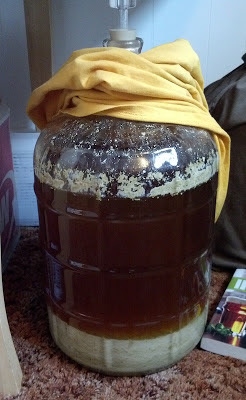 I have saved some yeast from it but it's about 4 months old so may be a little out of balance of brett to sach. What do you think? Might be worth investing in a new smackpack if I were to use this yeast rather than a 'clean' strain and then adding one or more of my various brett strains in secondary. Yeah, I'm sure Wyeast would have probably used Brett C for their old ale blend, so the Brett in the blend should definitely give you want you want. You could definitely just buy a new smackpack, I'm sure that would probably produce good results, though I don't know if the Sacch strain in it is the best for IPAs (or what strain it is, at all). If you have a preferred Sacch strain for the primary, you could just add the Old Ale dregs you already have after primary fermentation. Whatever Sacch is in those dregs won't really do anything (the beer having already finished fermentation by another Sacch strain), and the Brett in the Old Ale blend will then get to its thing, irregardless of ratios and balance. That sounds like the best plan. The old ale has a really nice Brett flavour, different from the Whitelabs Brett C. More like I'd expect from Brett Brux. How's the The Bretted IPA coming along? Have you tasted it recently? Great remarks and experiment. I think you did get close to the original IPA. If you look at this 1902 English brewing article, pale ale long stored in wood, then bottled and undergoing a further maturation period, was described as "peculiarly pungent" and yet "invigoratingly fresh". (If link doesn't work please mention this and I'll supply other details that you can easily pull it online). Your palate notes sound quite similar to this and I'd say Orval's character is similar too. The classic IPA was stored long in wood originally, not tanks, so whether a carboy would produce the same result is hard to say given that some flavour presumably would come from the wood and perhaps some oxidation from the porosity, but I'm sure you came pretty close. If you have any still in bottles (the brett one), it might be good to keep it a few months and see what development you get "in India", if you see what I mean. Maybe keep some in the trunk of the car until July? Awesome, thanks for sharing those notes. I guess I don't have access to pull up that article, but "peculiarly pungent" and yet "invigoratingly fresh" sounds spot on. That's very encouraging. Haha, I've only had a few bottles so far, so I'll definitely be keeping much of the batch around for a while to see how it develops. The trunk of my car or a hot closest might about as close I could get to those sweltering ship holds... it would actually be very interesting to brew this again and age it in a hot closet over the summer to see if that changes things. Hi again, I actually intended to put the comment above under your current (February 14, 2014) posting, so please feel free to switch it there if you can. Thanks. My blogging platform doesn't seem to have the sophisticated level of technology that would allow me to move comments (other than just copy / pasting)... oh well. I might mention some of those historic tasting notes in my new post, as I think it's very interesting how close they sound. Derek, thanks. It sounds like you were able to access that link, but if you weren't able to, let me know and I will tell you how to find it. Oops, I hadn't read your first comment until now, so I see you haven't accessed the article yet. Please stand by, I'll post details under the February 16, 2014 thread. Sounds very interesting! I think Cigar City may have done a few IPAs on cedar too. I've only had one or two beers aged on cedarwood but it's certainly got a very domineering, very particular character. I enjoyed it, but it seems like it could go overboard pretty quickly. Crisp offers Maris Otter extra pale ale malt with 1.5-1.9 lovibond. Recently brewed an IPA using it, 2.3% crystal 40 and some torrified wheat. The brew turned out very pale yellow.